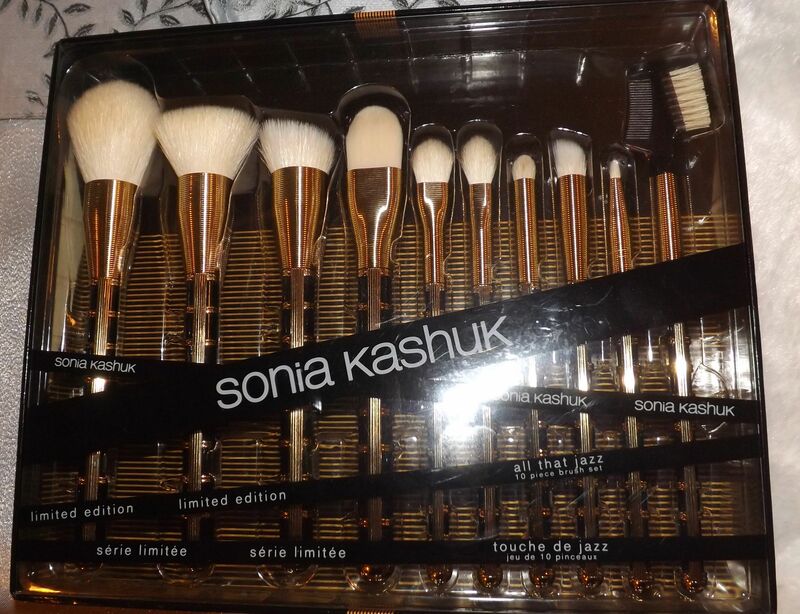 How gorgeous is this limited edition brush set from Sonia Kashuk for Target? Just for the holidays! The Sonia Kashuk limited edition brush set at Target. Ten (10) beautiful, functional and very affordable makeup brushes. Thank you Sonia Kashuk and Target! This is a standard domed powder brush that can be used for everything from loose and pressed face powder, to highlighter powder to blush if you are so inclined. Because of its shape it allows you to apply powder to the face with a light touch. This one is comparable to the large Sephora Airbrush pro brush. As described, this is a flat-top blusher brush that, in my opinion, will lay down blush more intensely than a rounded brush. Now the package labeling says this is a blusher brush and you certainly can use it that way, but my preference for this to use it to apply powder to set foundation. I own a Sonia Kashuk flat-top brush that I use to blend powder into my face after my NARS tinted moisturizer has dried down. This is my second-favorite brush in the set due to its versatility. If you want an intense layer of powder this brush gets the job done quickly. I am a big fan of duo-fiber brushes for cream blushes and liquid foundations. Even more so of this brush as it is cut at an angle and resembles the much more expensive Dior face brush (which retails for close to $50). The duo-fiber is best suited for the more modern blends of foundation, and I find the slant allows for a more precise application and blending. This is your standard flat foundation brush with rounded edges that are slightly graduated. This type of brush is the one I use to initially apply foundation to my face and pat it around areas such as my nose and to initially cover the dark circles under my eyes. Not much difference between this brush and my MAC foundation brush. This eye shadow brush is a bit too large and fluffy to appeal to me but for a beauty beginner it provides a quick way to shade an entire eyelid in one stroke. I wish the bristles were more compact. Now this brush is appropriately large and fluffy because you would use it to blend out your eye shadow look.. It is definitely a bit larger than my beloved MAC 239 brush for blending but is more like the MAC 217 brush. Let me say that as I have heavy-lidded eyes (like Penelope Cruz), this crease brush is too small for me personally. However, it is perfect for those with normal/smaller eyes compared to mine. This is the type of brush you would use to initially lay down shadow in the crease area of the eye before using a blending brush to blend. I use a LOT of cream eye shadows so me and duo-fiber brushes are BFFs. The fact that this brush is angled makes for more precise laying down and smoothing out cream shadow. Of course it will work fine for powdered eye shadow. Standard lash/brow groomer. This is indispensable to me for brushimg my eyebrows up and separating my lashes when I’ve put on a little too much mascara. 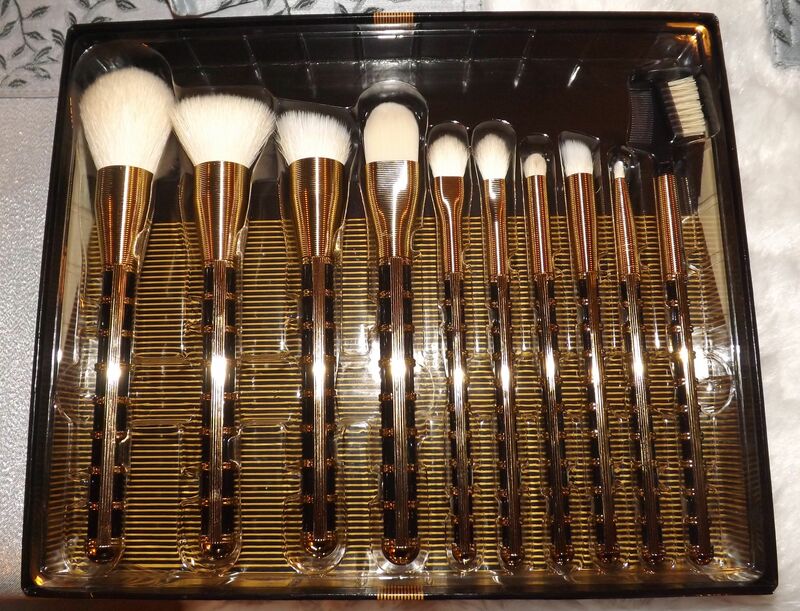 The synthetic brushes are made in China of very soft synthetic fiber. All of the brushes felt very evenly balanced in my hand. Another plus for this set is that the raised gold pattern on the brushes assist with gripping the brush with better precision as compared to the smooth brushes I own. And from a purely tactile standpoint the coils around the ferrule and the raised pattern on the handle just feels good on my fingers while I use them. When it comes to usage, I’ve found the larger brushes (powder, foundation) are prone to shedding a few hairs. Given how economical this set is I’m willing to overlook it. I own an Urban Decay Good Karma foundation brush that I paid $25 and sheds something awful. The Sonia Kasuk “All That Jazz” brush set retails for $34.99 USD. While I picked up my set at my local store, as of this writing Target is showing the set not available online for shipping but you can order online for pickup at the Target store location of your choice–subject to availability. And if you’ve got the Target RedCard you get 5% off of your purchase and free shipping to boot!